I carry 95% of the time, including at work. I absolutely love this pistol, ive become pretty good (accurate) with it. Its a great gun for "thumbs forward" imo. 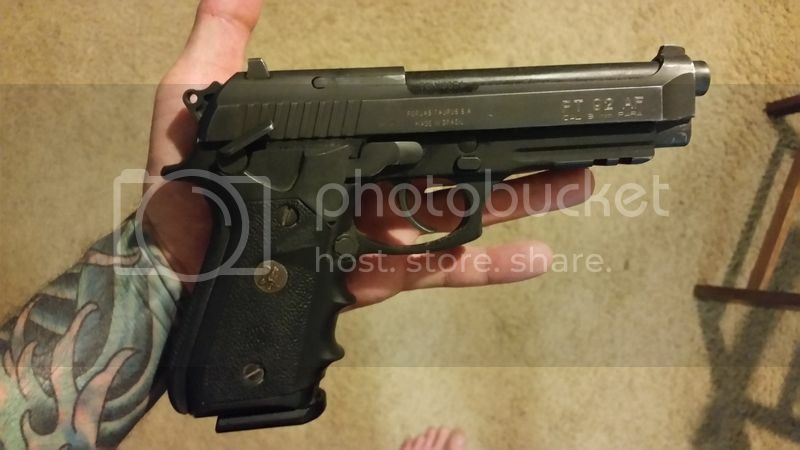 I have a Ruger LCP 380 laying around for when I finally decide to get my CCW license. But I've been really looking into getting a Diamondback concealed 9mm. Have any issues carrying that pistol? Looks bulky. Carry what you are proficient with. Also, carry what functions every time. Don't get hung up on brand. Two of the most popular "carry" guns, I hate. I don't buy into the hype. Also, caliber is less important than accuracy and reliability. In my experience, round placement is key. If you can stack round after round on top of one another, you don't need a .50 Desert Eagle because it has "knockdown power". You have to be proficient and accurate. Practice makes perfect. Get used to your weapon so it becomes second nature. Absolutely not, you should TOTALLY do that, and post the results on youtube! I have a hard finding pistols I lime because I'm picky. I prefer a hammer over striker fire and have to have a decocker. I've not heard of the pt40. I've only heard of the Millennium pt111. year and a half later, im still carrying the same pistol in the same AG holster. I've been daily carrying a Sig P938 when our great laws allow me. I also upgraded my Taurus to a Springfield XDS 40 that I usually carry on the side pocket of a vehicle but thinking of moving it to daily carry duties once I get ahold of a holster for it.